This poi I propose happens to be in the Bleak lands, which could use some love. Description: Planet four of this system is a gas giant whose rings feature a Notable Stellar Phenomena of particular note: It contains not one, but two kinds of crystalline structures in close proximity. The bright red rubeum ice crystals contrast with the blue-gray lindigoticum silicate crystals and offer the long-range traveller a quirky sight, both visually and scientifically. Description Quite similar to the famous "Labirinto" in Traikaae CH-Y c10, but on the opposite side of the galaxy. This rocky ice world is covered in a light fog, has an abundance of water geysers, canyons deeper than 10km, and mountains that peak above the mist. Many of the geological sites are landable, making for a great basecamp on long expeditions, and the sites that may be treacherous for motherships are excellent SLF racing centers. Found while approaching Kalipheron, I was immediately reminded of Labirinto when this beauty appeared in the FSS. I'm currently exploring the geosites, and finding which ones are suitable for basecamps or SLF/SRV racing. I'll be here for a day or two most likely. Come join me! I visited about half of the sites, and 21 & 47 were my favorites. Geysers on rolling hills were at 47, and spiky towers with narrow riverbed trails were at 21. Description: During the Distant Worlds 2 Expedition, some CMDRs passed through that system. It is unknown whether some of them noticed the beauty of the more distant planets of the main sun, or if they were blinded by the presence of an ammonia world close to the primary star. After travelling through lots and lots of icy rock - filled systems with my ship, the "Deepdiggin' Diana", the ammonia world A 2 got all the attention at first but a brief look into the system map showed that landable, 0.8G icy planet with a ring. And the view of that planet and its ring was quite worth the 2k-ls trip. The ring itself has a very dark grey color which reflects the sunlight in a brighter silver. When landed on the planet surface, the ring divides the twilight, making a rest on A 6 a bit surreal and adds a dreamlike tone to the scenery. Maybe the Low-Temperature diamonds are the reason for the rings color. GHJ2008 3 (also know as XTE J1650-500) is a binary system located 26 000 light years from Sol in the constellation of Ara. It was firstly observed in the beginning of 21st century and registered as transient binary X-ray source. The black hole was claimed to have a mass of 3.8 solar masses, which back then made it the lightest ever found black hole. Later the claim was retracted and the approximations were about 5–10 solar masses. Years later detailed system scan revealed that first calculations were right and black hole has a 3.8 solar masses. For now the system also contains a K-class star that will likely be absorbed by the black hole in the next several hundred years. times higher than second most massive black hole in the system. P.S. I was too far away when I noticed the lack of info, so I think that some more photos are stiil needed. Special thanks to CMDR Fackemout for helping with the translation. made a Z-type morphology and indicated the microquasar as strong X-ray emitter, also capturing another unrelated source. Data analysis revealed that system hosts a non-degenerate star and possibly one black hole. the system gravity. In any of the cases, it is a mystery to reveal for the modern scientist. V821 Arae (also referred as GX 339-4 and GRS 1009-45) is a moderately strong variable galactic low-mass X-ray binary source that contains a black-hole and G-class white-yellow star. System was firstly observed in 21st century and helped astronomers of those times in understanding black holes variable accretion disks. The system is a regular X-ray emitter because of the stellar matter, that flows from the star to the black hole and forms a disk around the latter. A strong variable relativistic jet is also usually observed. System holds only one ice world planet that regularly witnesses dances of the black hole and the star. P.S. I also have some photos with a ship in the foreground but I do not think they are actually needed. P.P.S. I actually used various sources to make more content descriptions, and the presented ones are the most informative that can be added to the entry for those who are interested. And, yes, the most content paper about GRS 1730-312 seems to be in Russian only , so if you manage to find a translation or some other article it would be really nice. 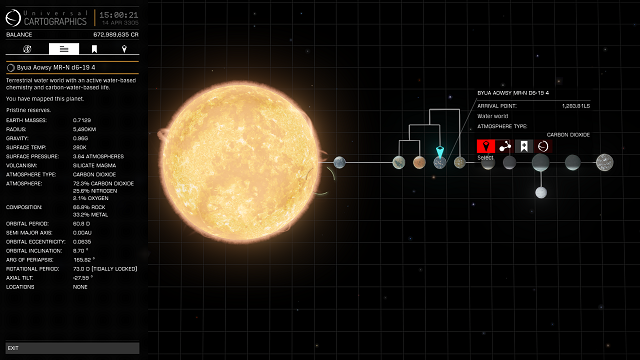 Description: A system with nine metal rich moons (4 with geo sites) illuminated by two NS, a WD and a Y dwarf. at least I think that 9 MRmoons aren't that common ?! EDSM's stats (https://www.edsm.net/en/statistics/bodies/planets) show that the current largest-known number of of metal-rich bodies in a system is 35. 9 isn't even nearly close enough. You're amazing! Would you mind also doing one for SLX 1746-331? Wasn't aware of that stats page, thx! No prob, I will do some research and post here after I visit it and take some screenshots (I am in Sag now so it will not take too long). I decided not to divide my recent discoveries into several posts and show everything in one. The discoveries will go from most interesting to least (in my opinion). A cluster of 20 systems that contain 84 helium-rich gas giants in total. It is located less than 500 light years from The Anvil (Eeshorks ZK-B B2-9) and Greae Phio (Greae Phio LS-L C23-221) nebulas and lies on the Bubble-to-Sagittarius A* path, therefore making it an interesting point to visit for the travelers. Plus, not all of the nearby area was explored, so there may be some more helium-rich gas giants there. A violet-black nebula located 8500 light years from Sagittarius A* on the border of the Empyrean Straits. It is located a little higher than the main galactic plane and floats above the disk. It hosts several water and earth-like worlds and also several colonies of roseum sinuous tubers in some of its systems. The nebula is also accompanied by the nearby "Medusa's Tentacle" planetary. Located 250 light years from Black Medusa Nebula, this planetary does not hold anything particularly interesting inside but can form some decent views being in the background with the Black Medusa. different ways of expanding gases after death of the central star. A lonely earth-like wolrd bathing in the red rays of L-type dwarf. It is located 28 light years from its star and should have a nice view from the surface. There is also another L-type dwarf 500 light seconds away which should be the second brightest star in the planet's sky. 2-3 close stars of any type are not considered as interesting POI. 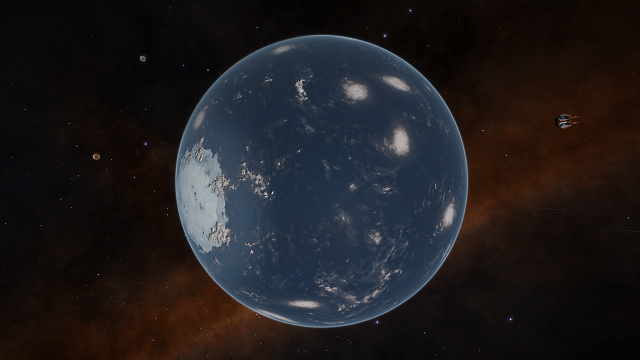 Description 3,000 light-seconds from the main A-class star, a small rocky moon (A 6 A A) hugs its parent water world so closely ( under 9 Mm) as to provide a majestic view of the massive azure body from several of its geological sites. With a rotational period of just .2 days, it’s also possible to watch a neighboring ringed Y-class dwarf slowly float across the viewing plane. The observer is treated to a spectacular view of the looming aquatic body overhead as well as the ringed purple giant as they pass across the viewing arc. 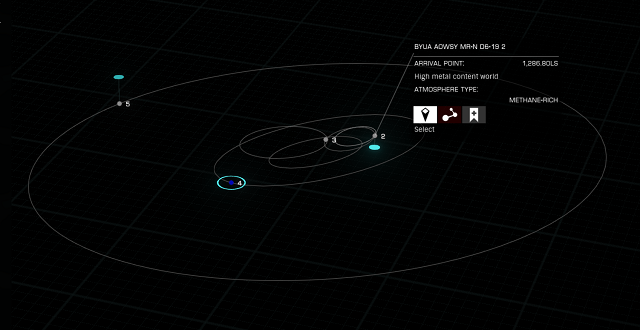 Description: A system which contains a quadruple planet pair. The pair contains a Water World, and the innermost planet is a Water World as well. I hope this is allright. This is my first submission. Description : Planet A 3. A happy hmc world located about 2500 ly from Colonia, on the way to the bubble. Description: These two small icy bodies, bodies 5A and 5B, measuring 416km and 400km in radius respectively, are orbiting each other is a very close binary system and have a nice view of the other moon and the gas giant they are orbiting, depending on which one of them you land on and at what time. These planets both have silicate vapour geysers, body 5A presents 23 geo sites, while body 5B presents 10, these geo sites can add to the allready amazing sight of the neighboring moon and/or the gas giant. Another charm of these 2 moons is their weird, misshapen appearance, moon 5B is more misshapen than body 5A and looks roughly like a weird potato, but both planets are fairly cute in a way. Getting a nice place for a screenshot can prove a bit difficult because of their proximity of 1 - 2Mm, it is very easy for the other moon to be shadowed by the one you are landed on. "A red-green supernova remnant, containing a collection of planets that co-orbit both the neutron star and the class F white star found in the system. The most notable one is AB 2, a High Metal Content world with no less than 13 moons." I left out the bit about the image at the end, since I can't see the image itself.